Purpose: Women with disabilities are particularly vulnerable to violence and often at risk of being violated sexually. 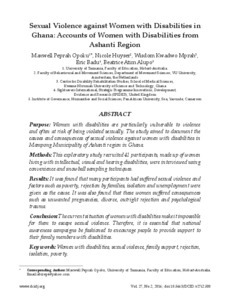 The study aimed to document the causes and consequences of sexual violence against women with disabilities in Mampong Municipality of Ashanti region in Ghana. Methods: This exploratory study recruited 41 participants, made up of women living with intellectual, visual and hearing disabilities, were interviewed using convenience and snowball sampling techniques. Results: It was found that many participants had suffered sexual violence and factors such as poverty, rejection by families, isolation and unemployment were given as the cause. It was also found that these women suffered consequences such as unwanted pregnancies, divorce, outright rejection and psychological trauma. Conclusion: The current situation of women with disabilities make it impossible for them to escape sexual violence. Therefore, it is essential that national awareness campaigns be fashioned to encourage people to provide support to their family members with disabilities.